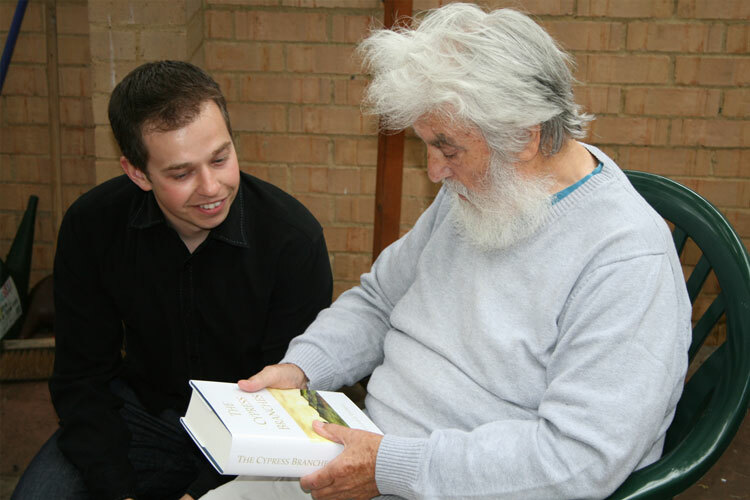 Taken on the day of the launch of the hardback version of The Cypress Branches in 2009. 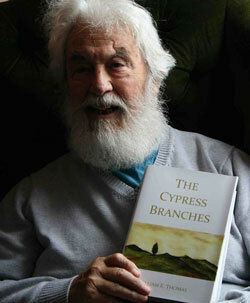 The Cypress Branches is an epic work of fiction written by William E. Thomas and published by me, his grandson Mike Harris. This blog chronicles the journey I am undertaking to not only get my grandfather’s book discovered, but also to discover more about my grandfather. The project began in 2009 by printing William’s epic book in hardback. William had recently been diagnosed with Alzheimer’s disease, and he was rapidly losing his short term memory. My aim was to allow William to see his work in print before his illness robbed him of the chance to enjoy it. I worked on it myself, using my copy-editing, proofreading and creative skills to produce a beautiful book, of which 108 copies were printed. Those books were sold to family and close friends, and that’s where I thought the journey would end. But feedback from readers was incredibly positive. It turned out I wasn’t the only one who loved reading William’s books! So, attention turned to releasing the novel in paperback and ebook form. Since 2009, I have been working hard to turn The Cypress Branches into a series of shorter novels, transforming it into a trilogy whilst retaining the integrity of William’s original concept and vision. Pegasus Falling, part one of the trilogy, was released in 2012 and It Never Was You, the second instalment in 2013. Work now continues to release the third instalment. Through this blog I aim to chronicle the journey I am taking to get William’s work out into the world, the lessons learned along the way, and hopefully to pass on a little bit of wisdom to others who venture into the self-publishing realm. I would love to hear from readers, so if you have any questions, if you are a blogger interested in featuring William’s work or his story, or you’d like to find out more information, please drop me a line. William proudly shows of his masterpiece. Taken in 2009, on the day of the hardback launch. He always believed passionately that education leads to opportunity and studied part time for both a Bachelor of Science and a Bachelor of Arts degree. He was proud to be one of the first students to enrol with The Open University. William’s health started deteriorating shortly after finishing The Cypress Branches and he was diagnosed with Alzheimer’s disease in 2006. After a decade-long battle against the disease, William passed away peacefully in February 2014, surrounded by his family. He was 88. I think that what you are doing will create a great legacy for your family. I hope to see updates on the project. This sounds like a fascinating legacy! I look forward to reading more. Any IDE where I can get a copy of the hardback . Read part 1 at 2 sitting excellent! Mike I had not initially realised that on the inside back cover is a pencil inscription from, I think, your father (?) dated April 2014, leaving the book in Hay on Wye where I bought it. Hi, its August 2018….i read the 2 books and cant wait for book #3! When can I expect it? Firstly, please accept my apologies for taking so long to approve your message and to reply. As you may have spotted, it has been very quiet on the Cypress Branches project for some time now. There are many reasons for this, and it has been just as frustrating for me as it has been to the loyal readers who have been waiting so long for the third book. It hasn’t been forgotten, don’t worry, and I’m delighted to say that the hiatus is finally over, and I’m hoping to announce a publication date very soon. I’m hoping that date will be this side of the new year, but if not, it will be very early 2019 at the latest. As soon as I know more, I’ll be updating the blog and the website, so watch this space! Thanks again for your interest. I’m sure Book 3 will be well worth the wait!